The biggest success for medical imaging arrives when the findings therein provided have clinical usefulness and directly impact patients’ management and outcome. Similar aims should always lead the work of imagers and particularly ours in nuclear medicine. 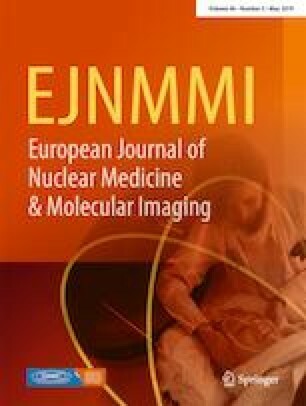 Hence, the significant results obtained from important clinical trials proving the relevance of positron emission tomography (PET)-guided treatment in patients, such as HD18 or AHL2011 in advanced-stage Hodgkin’s lymphoma [1, 2] appear exceptional and “world breaking”, although they should be the natural modus operandi in molecular imaging research. Based on linear concepts and “simple” reading with Deauville score , the results of these trials prove what is known as the current paradigm of response in Hodgkin’s lymphoma (Fig. 1): after two cycles of chemotherapy, metabolic response on PET is already able to predict the outcome of the patient and can be used to adapt therapeutic intensity accordingly . This concept took time before being endorsed by the medical community. 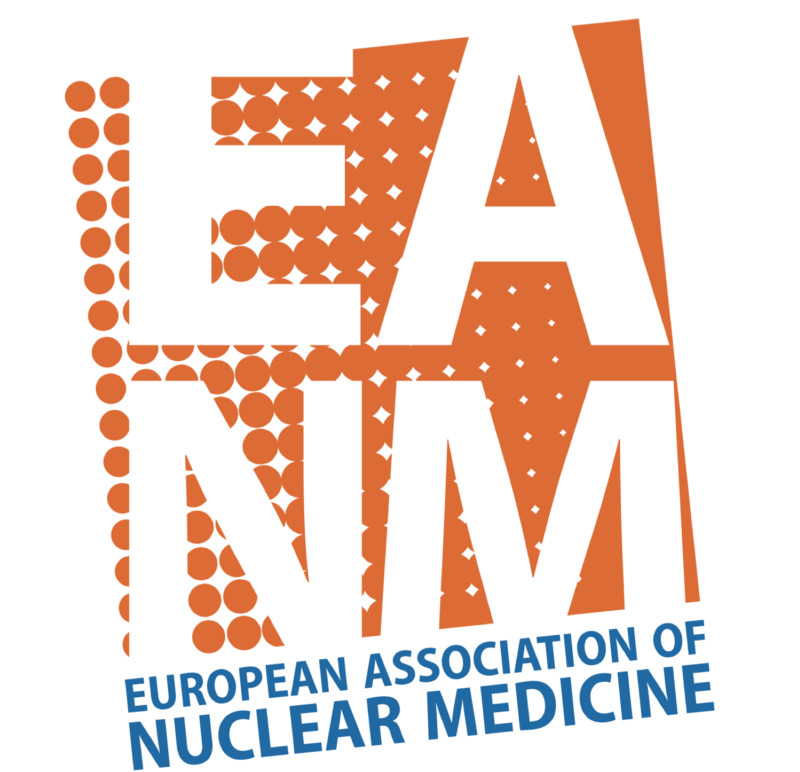 It now finds arguments in the extensive literature published in the last decade and pioneered by nuclear medicine physicians and medical oncologists working together. The current paradigm is based on several premises: 1) imaging response is assessed based on metabolism and not only on morphology; 2) international criteria for response help discriminate the different pathophysiological meanings of residual uptake; 3) the best moment to assess response is defined in order to change efficiently the therapeutic strategy [5, 6]. Yet, the evidence for this paradigm of response now appears clearly demonstrated for first-line treatment and in Hodgkin’s lymphoma. Does it fit as a reference model for other lines, or even in case of immune-modulatory regimens? At a first, superficial sight, the model might not fit. The worldwide “bugbear” of immune-related side effects and associated risk of false positive uptake of 18F-fluorodeoxyglucose (FDG) have markedly limited the use of FDG PET in immunotherapy trials, particularly with the advent of checkpoint inhibitors, in Hodgkin’s disease. It seems as if the history of what is done for chemotherapy has been forgotten, and so it seems also for the functional value of PET results. We must not forget, anyhow, that FDG uptake in a Hodgkin’s tumor at staging is by its very nature “false positive”, since tumor lesions are composed by only 1% Reed–Sternberg (RS) cells, which “dive” in a vast ocean of immune infiltrate. Hence, the high metabolism documented is nothing but the result of the interrelationship between these solitary RS cells with the tumor microenvironment, and the so-called “pseudo-progression” under checkpoint inhibitors should not surprise. It translates in FDG uptake the effect of the drug on the immunocompetent system and should be used to help understand the phenomenon. Notwithstanding, some criteria have been built in an attempt to classify the different types of response (LYRIC) . Others came back to old RECIST-type analysis (RECIL) reducing the role of PET . This limitation of the PET use with checkpoint inhibitors is clear when performing a PubMed research for: “PET”, or “immunotherapy”, or “Hodgkin”, or “lymphoma”. 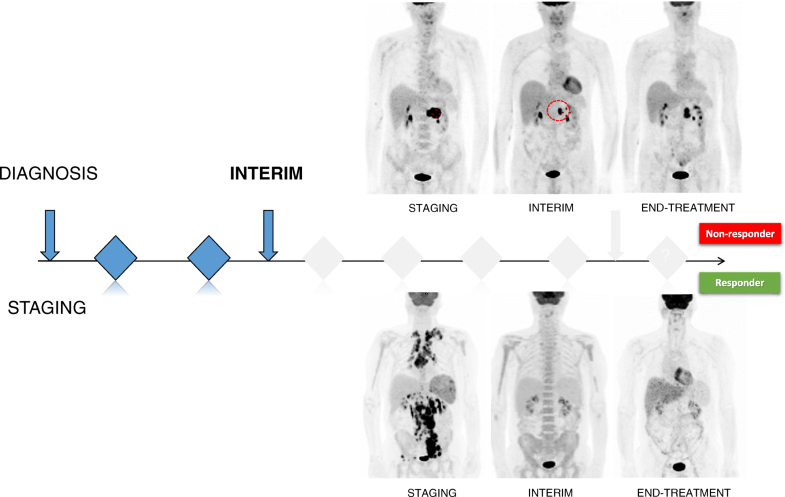 Only three original articles appear pertinent to the argument for checkpoint inhibitors, all retrospective [9, 10, 11], with one moreover analyzing chemotherapy or chemo-anti-PD-1 combination after failed anti-PD-1 therapy . Nevertheless, the common trait d’union for the manuscripts is the predictive potential of metabolic response assessment with Deauville score already after a few cycles of immunotherapy (Fig. 2). The papers quote the 5-point scale after 2–3 months of anti-PD-1 (either nivolumab or pembrolizumab) as predictive of subsequent response 4–6 months later [9, 10]. Moreover, the classification of patients into responders (Complete Response + Partial Response) or non-responders (Stable Disease + Progressive Disease) to immunotherapy could correlate significantly with progression-free survival of the cohort . Yet, when the common models of response to therapy seem to fail in new immune-modulatory regimens, Deauville score, like the mythological Phoenix, rises from its ashes. Can we state that the game is completed? Absolutely, not! Large-scale prospective trials, designed as well as done by Kobe and colleagues, are mandatory. Moreover, as expert opinion recommendations propose, the straightforward visual analysis with Deauville score must be assessed alongside the possibility of “pseudo-progression”, the occurrence of immune-related side effects and the right moment for response assessment [7, 12]. The Italian Association for Research on Cancer (AIRC – Associazione Italiana per la Ricerca sul Cancro) is acknowledged for the support of this research. E.L. is supported with the grant no. 18,923 provided by AIRC. Kobe C, Goergen H, Baues C, et al. Outcome-based interpretation of early interim PET in advanced-stage Hodgkin lymphoma. Blood. 2018. https://doi.org/10.1182/blood-2018-05-852129. Rossi C, Gilhodes J, Maerevoet M, et al. Efficacy of chemotherapy or chemo-anti-PD-1 combination after failed anti-PD-1 therapy for relapsed and refractory Hodgkin lymphoma: a series from Lysa centers. Am J Hematol. 2018. https://doi.org/10.1002/ajh.25154.